University of Houston Law Center student Annie Bolding. 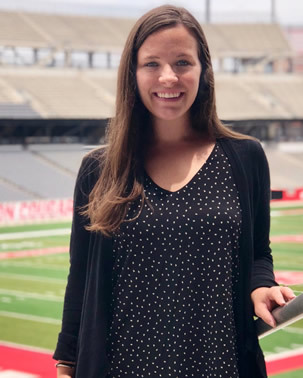 June 12, 2018 — Annie Bolding, a second-year student at the University of Houston Law Center, will strengthen her legal skills this summer while interning at the University of Houston Department of Intercollegiate Athletics. "I am excited about the opportunity to utilize my interpersonal skills and refine the ability to distill complicated information to a variety of audiences," Bolding said. With previous experience in a law firm setting, Bolding said she can use this fellowship to explore a non-traditional legal career. "I have not yet decided where I ultimately want to end up, but I am a fan of both options — each presents challenging and exciting opportunities," she said. "As I was applying to summer jobs, I came across this opportunity and was intrigued by the chance to see how the system worked from the inside. "It was clear from the outset that this opportunity would provide a fun twist to applying the skills I have gained thus far in law school." Attorneys in the NCAA frequently work on compliance issues and ensure that NCAA bylaws are followed. If violations arise, it is necessary to file reports and waivers for a possible investigation. The biggest difference between her experience with UH Athletics and previous jobs is the subject matter. "At its core, this job is very similar to other jobs I have had — working with people in various departments, handling and creating documents," Bolding said. "One of the fun parts about working with athletics is the breadth of areas that the compliance office gets to touch. Not only do compliance responsibilities involve many different sports, but also a wide range of issues and personnel." Bolding said having family based in Houston and the city's abundant opportunities help solidify her decision to attend the Law Center. She said studying under the late Dean Emeritus and Professor Raymond T. Nimmer has been one of the highlights of her law school career so far. "Not only was Contracts with Professor Nimmer my very first school class, it was a subject I found particularly interesting," Bolding said. "He was a truly gifted professor."